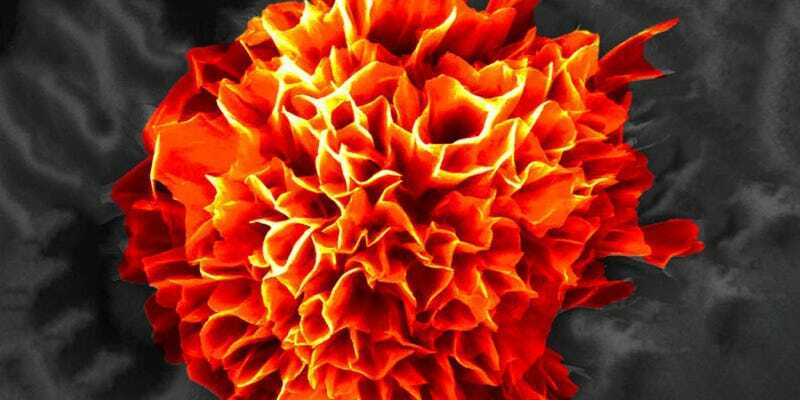 It looks like a vivid red carnation, but this flower is actually the result of mixing simple organic chemicals—and it measures just 10 microns across. Created by Sheshanath Bhosale from RMIT University in Melbourne, the flower blooms when phosphonic acid and melamine are mixed in water. As they react, hydrogen bonds form — the same ones that give ice its neat crystalline structure — in turn creating the crisp, petal-like planes in the structure. The microflowers, as the researchers call them, grow form nothing to this fully-formed structure in around three hours (the early stages are pictured below). The resulting structures are just 10 microns across, so they’ve been magnified 20,000 times to create the images here. (They’ve also been artificially colored — sadly they’re not as bright as flowers in real life.) They’re also not just being made for fun: the structure of these small objects could be used to create new kinds of hydrophobic coatings — potentially making them the first ever water-hating plants.